FAID®, our Fatigue Assessment Tool, is a family of scientifically supported modeling solutions that assess the risks of hours of work related employee fatigue. It is suitable for use in any number of industries where shift work poses potential problems. 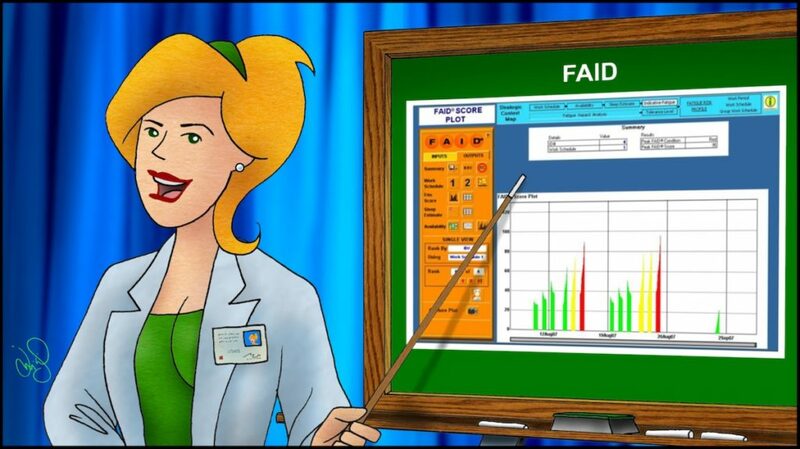 I have been using FAID® for about 15 years since I first heard about it at a human factors conference. I downloaded an evaluation copy of the software and found it easier to use than some other fatigue modeling software that I tried and because I only have to know the hours worked on a schedule. You can download an evaluation copy of the software at the Interdynamics software or contact me for information. Our consultants use FAID® for evaluating shift schedules for potential fatigue risk, showing Controllers times during shifts when they are most likely to be fatigued, as part of fatigue hazard analysis, for quantifying the potential contribution of fatigue in incidents, for comparing one shift schedule to another, and for building FAID® scenarios for clients based on different overtime situations. To ensure employees are given ample intervals of rest in between shifts and that they are made aware of certain times of their shifts where fatigue would be most prevalent. We have built an Excel spreadsheet with the FAID® results that has almost every deviation of overtime possible. Quantifying the potential contribution of fatigue in incident analysis of operating errors and near misses. Tracking hours of service; monthly forecast to prepare Controllers for potential fatigue; identifying who is available for callouts or extra work; record keeping for CRM purposes.